I pretty much spent the entire day from 8:30 until about 5 out in the sun, leaving me with the worst tan lines in the world (including bra loop holes...doh! ), and my first full on sunburnt experience (as far as I'm aware). It was a lovely day though! I spent the morning doing a car boot sale with my adorbz little sister, and then a couple of hours with my aunt and cousin at the local pub and then the evening chilling out with John. A busy day indeed! 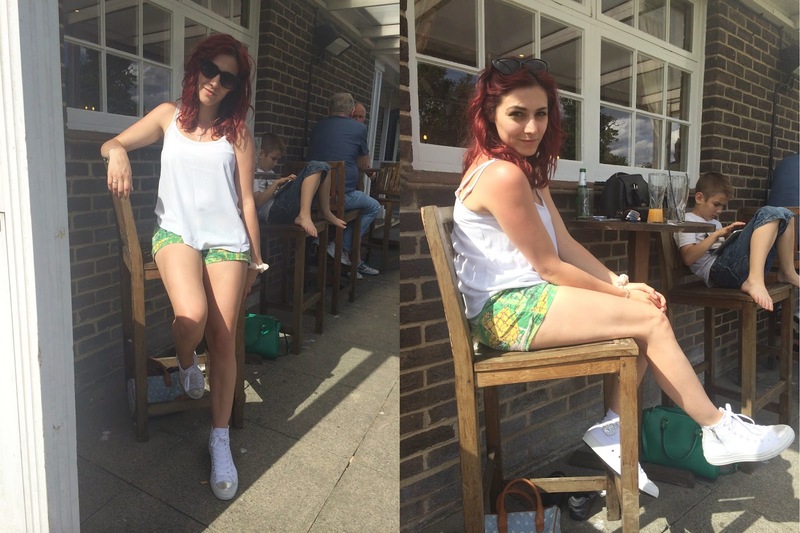 Because it was so warm outside, I took out my absolute favourite shorts ever: pineapple shorts. John got me these for our first holiday together to Zante and forever have they been my favourite shorts for the lovely fit and amazing print. I can't buy another pair that will compare to how much I love these. I've always loved the pineapple print and it makes me so happy that pineapple print is so in now, and that I can be totally on trend with shorts I've had for about 3 years now! I was wearing it with my peach Miss Selfridge cami in the morning but it got pretty dirty so for going out I swapped it out for my Dorothy Perkins white one! I thought it looked quite good paired with my newwwwww Converse trainers I bought from Very! I had a pretty amazing discount code that made them a bargain and a half... And they're already sold out! I've been wanting a pair for a long time, and I definitely found my perfect white pair here. They're so comfy and go with so much. I love that I know how long they will last me too... They'll definitely be worn to death like my last pair! I love me some converse... May have to get another pair. Suggestions on cool ones please!? How did you spend your Sunday? Was it super sunny and hot where you were too?